Supplement traditionally used to increase athletic performance. Beneficial effects for the immune, cardiovascular, respiratory, renal, sexual and nervous systems. May increase production of corticosterone. 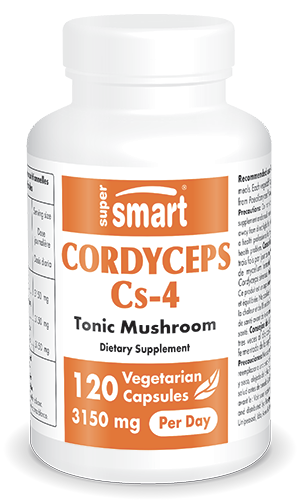 Our dietary supplement Cordyceps Cs-4 contains a specific extract of the fungus or mushroom Cordyceps sinensis. Little-known in the West, this fungus is native to Asia where it grows primarily at an altitude of over 4000 metres in the mountainous regions of Tibet, Nepal, Bhutan, China and India. Despite the quite specific conditions in which it grows, it has been used for several thousand years in traditional Asian systems of medicine. Cordyceps sinensis has been used therapeutically for millennia. In traditional Chinese and Tibetan medicine, it is regarded as an invigorating food, excellent at fortifying the body. It is also used to treat certain cardiovascular, kidney, respiratory, nervous and sexual problems. In addition, research has shown that taking Cordyceps sinensis may be associated with benefits for the immune system. As a result of its exceptional properties, Cordyceps sinensis is much-valued in the sporting world for its particular benefits for improving physical performance. This mushroom sprang to fame at the World Athletic Championships when the Chinese female athletes won almost all the endurance events and broke several records. Their coach attributed their success to “intensive training and a diet high in Cordyceps”. According to the magazine Track & Field News, “the Chinese athletes made the greatest quantum leap in the history of human performance”. Since their achievements, Cordyceps sinensis has regularly been the subject of scientific studies published in specialist journals. It’s safe to say, we’ve not heard the last of this mushroom! Scientific progress has meant that the Cordyceps sinensis mushroom is now available to buy in dietary supplement form. Our new supplement is formulated from the main variety of Cordyceps sinensis: Paecilomyces hepiali Chen, also known as Cs-4. Available in bottles of 120 vegetarian capsules, this product has a recommended dose of two to three capsules a day. To boost the tonic effect of Cordyceps sinensis and improve sports performance, you may also be interested in our taurine supplement, while our Adrenal Support product can be helpful if you are fatigued or lacking in energy due to stress. Another mushroom may also be of interest for its health virtues: reishi, also known as the “mushroom of immortality”. Each capsule contains 525 mg fermented mycelium of the Paecilomyces hepiali Chen (CS-4) strain of Cordyceps sinensis.